How would it be if German games suddenly weren't allowed to use the seasoned principle of "place tiles/pawns to gain majority in areas" and "gain VP in these areas and keep track of them on a victory point track"? The propagation of this principle through games like "El Grande" is perhaps the biggest achievement of German game design: the possibility to create a situation of fierce competition without resorting to wargame principles of destruction and conquest, the embodiment of the principles of democracy in gaming terms. 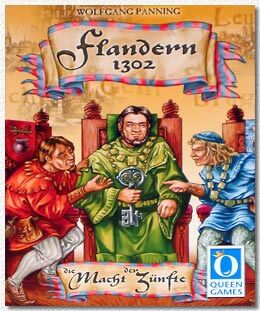 "Flandern 1302", the new game from Queen Games, certainly doesn't invent the wheel in this respect, many might feel a slight tinge of "done that, seen that" when reading the rules. But this doesn't necessarily make it a bad game. In fact, "Flandern 1302" has some things going for it. The board and tile design is especially beautiful, and there is a certain pleasing feeling when completing the various cities with various unusually shaped tiles. The players act as guild masters in medieval Flanders. The play of cards gives players the possibility to place tiles of his/her affiliated guild. The cards determine the possible cities in which tiles can be placed. Some of the cities already have a city centre in the colour of the player, but it is this player's decision to use this advantage or not. Interestingly there is also a "neutral", grey colour, which can actually win a majority and even get points (handy if you'd rather have neutrality win than another player). The latter mechanic somewhat offsets the kingmaker effect that games of this sort sometimes have, especially when the selection of tiles becomes limited and you may be forced to play tiles to another player'a advantage. Of course there are the usual shticks that make these kind of games interesting. 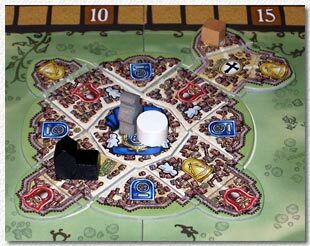 It is possible to place tiebreakers ("Zunftmeister"), heighten the value of the city through church tiles, and to play cards for better hand management. A new idea is that cities can be enlarged for possible more points but also more competition. As is usual in these games one can never be everywhere at once, so it is good to not spread yourself too thin. A winning move can be to save the right tiles and be the only payer who can continue to play at the end, but this is not easily achieved. That's already all there is to this game - some people might call it too simple, others will enjoy that this game can be quite quickly played and enjoyed as the abstract tile-laying game that it is. If you don't have enough of this kind of games yet, "Flandern 1302" can be wholeheartedly recommended. It is a solid design with no major flaws apart of the usual group dynamic effect that sometimes makes area competition games a bit unsatisfying. But a solid design it is. Others might prefer to wait for the next gaming revolution - but who knows how long we will have to wait for it? There could be worse things than playing a game of "Flandern 1302" while waiting for it.